Joey Bosa has been hailed as the second coming of JJ Watt by some. The son of former Miami Dolphin John Bosa had an eye popping career at Ohio State and impressive measurables to boot. The 3rd overall pick of the 2016 NFL draft by the San Diego Chargers finished with 148 total tackles, 51 tackles for loss, 26 sacks, and 5 forced fumbles in only 3 years. I was pretty hot on Bosa entering into the 2016 NFL Draft. He and Ezekiel Elliot were the best players on my draft board, but I knew they’d both be gone early before the Texans came up. I hoped to pull an autograph of Bosa at some point but had no luck at all- so I decided to go TTM. Well beggars can’t be choosers- as the Sage Artistry that I really liked did not come back to me. Instead Joey sent me a Panini Contenders School Colors card. Not that I am complaining or anything. 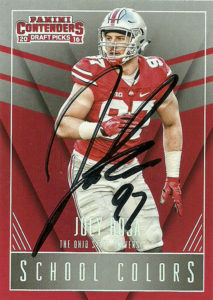 There has been speculation that the autographs coming back were fakes of Bosa, but really they just look badly rushed. Also if they were fakes, then why stop signing all together? With that being said, Bosa at this time no longer signs autographs through his home address anymore.